Physical activity is associated with a variety of health benefits, such as lowering the risk of obesity and heart disease, and utilizing recreation spaces provides the necessary exercise to live a healthy lifestyle (USSG, 1996; Berg et al., 2015; Peters et al., 2010; Neilsen & Hansen, 2007). However, citizens of urban communities often experience barriers that may restrict access to these recreation areas and exclude them from the benefits, such as the lack of transportation routes, poor public perception of safety, and the lack of universally accessible elements (Giles-Corti & Donovan, 2002; Lenhart et al., 2017; U.S. Access Board, 2014). Recognizing and removing these obstacles are key to creating a healthy community. Urban areas have made efforts toward this goal, yet, despite having a diverse set of public recreation spaces, the level of obesity and heart disease in Greater Worcester remains significant. Community members and local sponsors can collaborate to implement strategies to increase public engagement in accessible recreation, thus helping to improve public health (Vermont Department of Health, 2013). Following this principle, the Central Massachusetts Regional Public Health Alliance (CMRPHA) was created by seven municipalities in the Greater Worcester Area to address prevalent public health problems in these communities. This organization developed a set of objectives within the Community Health Improvement Plan (CHIP) to address public health priority areas determined by the Community Health Assessment (CHA). More specifically, the CHIP created objectives to increase the awareness of accessible recreation spaces to confront the CHA’s priority area on physical activity. However, recreation spaces in CMRPHA communities had not been assessed based on specific community needs and desires, and this information was not available to all population groups. We later conducted semi-structured interviews with various stakeholders – including government, private organizations, nonprofit organizations, and community members – which enabled us to determine five major criteria necessary for thoroughly assessing the health equity of recreation spaces: Safety, Transportation, Access, Recreation, and Social Value (S.T.A.R.S.) (Figure 9). We then created a field data sheet (FDS) based on these criteria as a tool to assess and store accessibility data. We then developed a rubric-based scoring method from the FDS to determine the relative degree of health equity and identify featured spaces for public promotion. On the rubric, each of the criterion had a sub-criteria section that had a 1-5 scale scoring system, while still reflecting the FDS questions and checklists. It is important to note that the level of precision used with this tool to collect data and conduct assessments supports a general summary of the S.T.A.R.S. criteria. We discovered that identifying and assessing all features of an area was time consuming, therefore a broad set of questions and checklists enabled the assessment process to be more efficient. Therefore, the format in which this data was presented is meant for easy public understanding and can be used as a foundation for others to develop a more comprehensive system in the future. Using previous assessments from the OSRP, the team entered information into the FDS in order to develop a fieldwork schedule that prioritized locations where information was lacking. To ensure consistency with the assessment process, the team pretested the FDS with representatives from the Commissions of Disabilities and other organizations. Photographs and notes were taken to supplement the responses in the FDS. 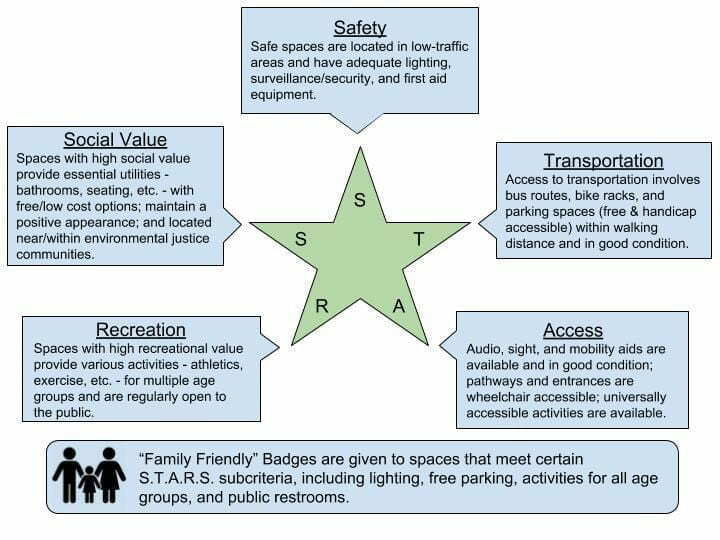 Based on the information entered into the field data sheet, each recreation space was given a score for the S.T.A.R.S. 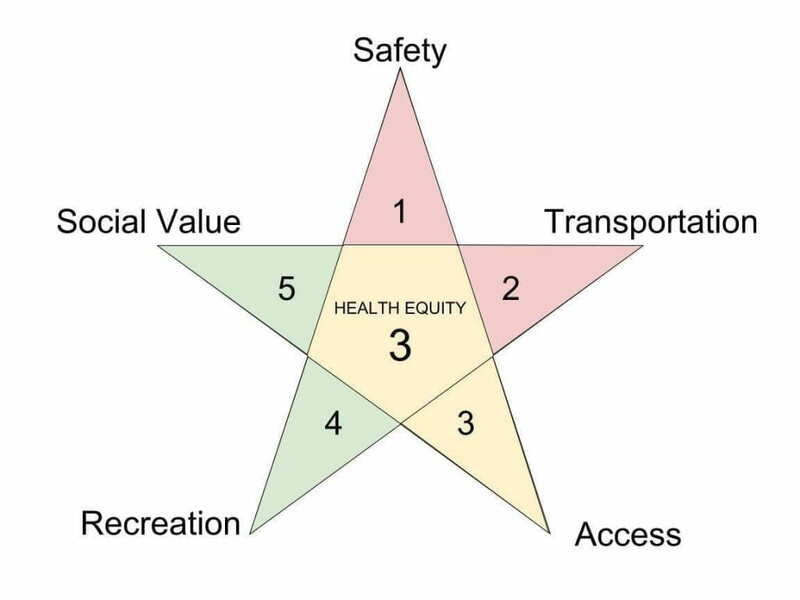 criteria as well as an overall health equity score that was visually represented using the team’s Health Equity Star design (Figure 10). Table 21 shows the final scores for each of the sections with some of the spaces visited. These raw scores were then used to identify a set of “Features Locations” based on their overall scores and/or accessibility features. 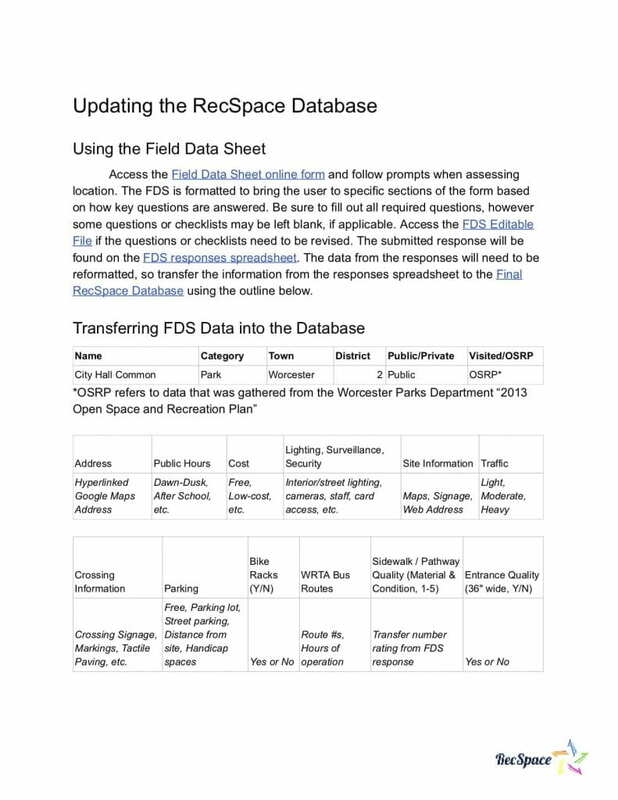 RecSpace Database Stores the results from field data collection process and helped us score each location. Field Data Sheet Allows researchers to efficiently assess locations using questions and checklists. S.T.A.R.S. Rubric, Scoring Method Quantifies the results of field data collection and identifies sites’ health benefits and areas for improvement. 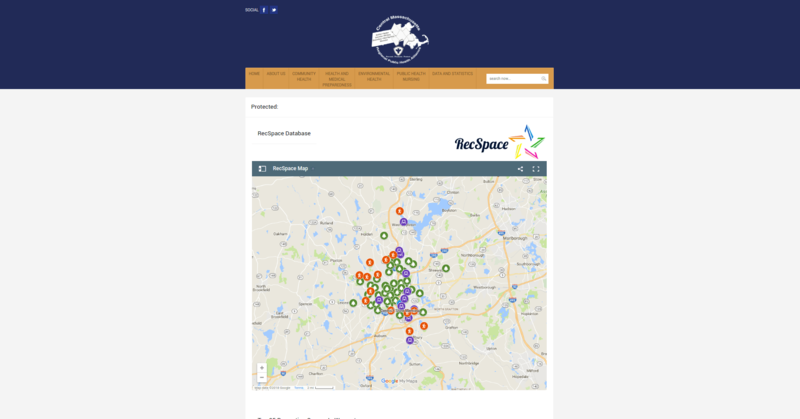 RecSpace Web Page, Map Displays the full and featured list of recreation spaces on a user-friendly platform, and enables users to filter recreation spaces to match their interests. 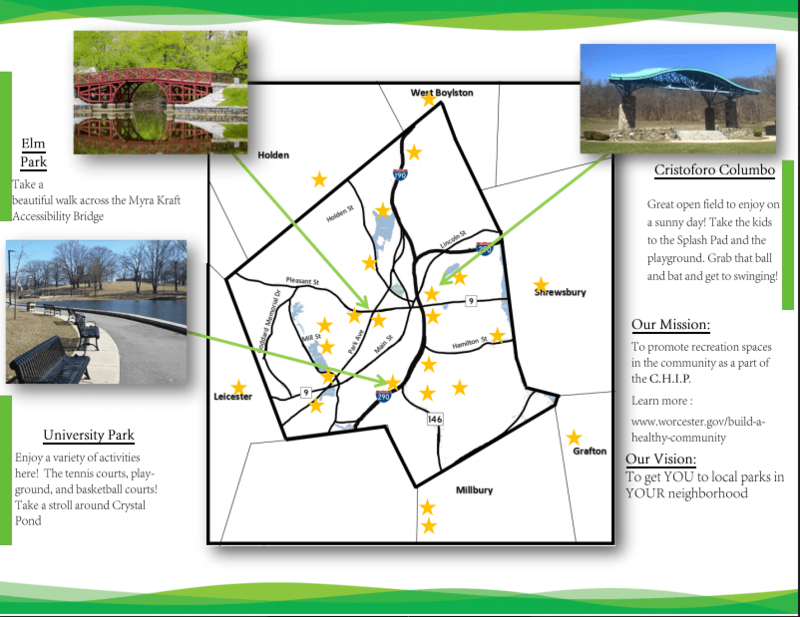 RecSpace Guidebook, Brochure Communicates key health equity concepts and information to the public in a concise, understandable format. 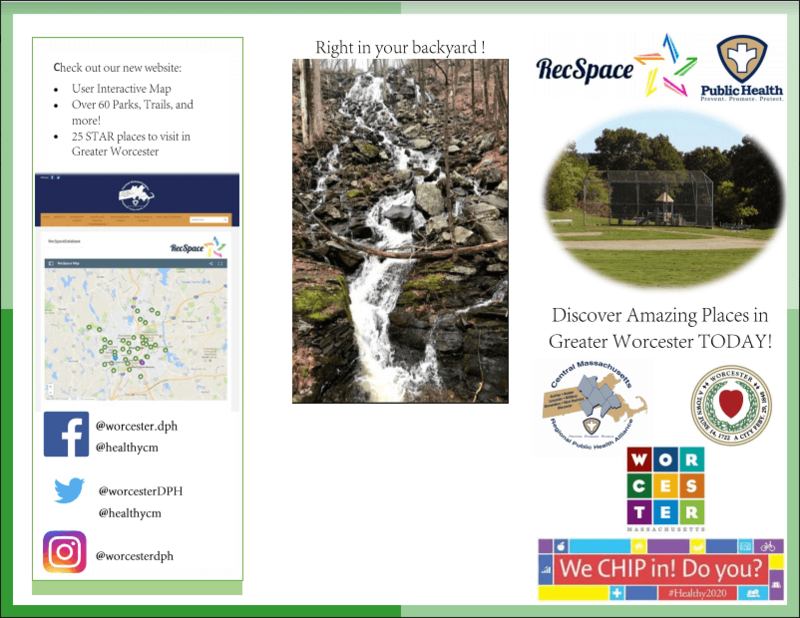 Promotional Video Showcases some featured recreation spaces in Worcester to generate public interest and to guide viewers to the RecSpace web page. RecSpace Revisions Manual Provides WDPH staff and future project teams with directions on how to update the RecSpace’s resources. 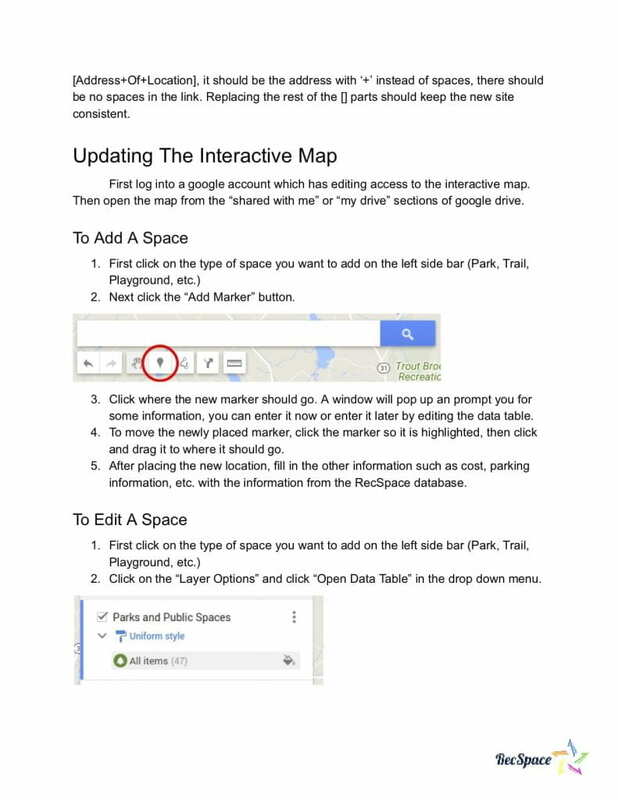 The RecSpace web page allows users to filter through the set of recreation spaces on the map based on the features of interest (Figure 20). 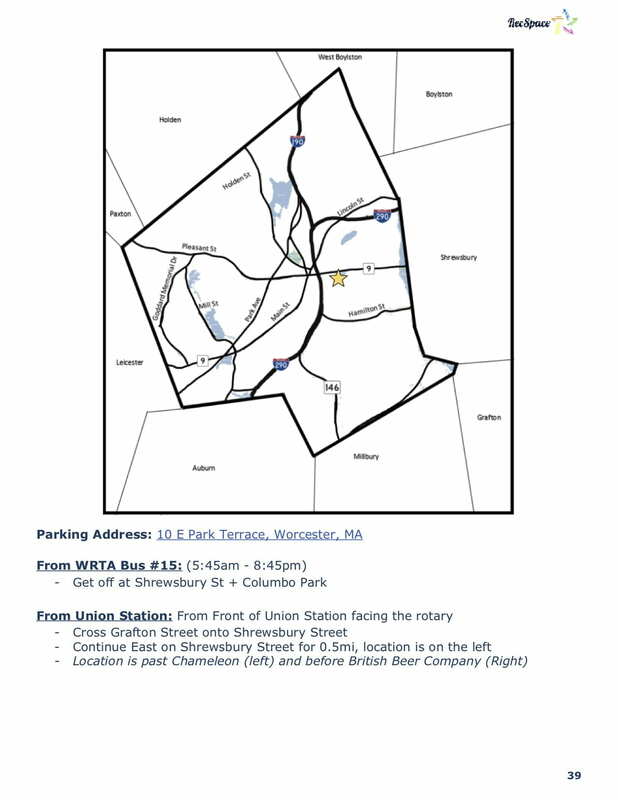 For more detailed information, we developed the RecSpace Guidebook (Figure 16) containing full summaries, pictures, public transportation routes, and walking/biking directions from the nearest bus stop and from a central location, such as Union Station. Paper brochures (Figure 17) were created and given to the WDPH to distribute throughout the city. To secure the sustainability of this project, we developed the RecSpace Revisions Manual to be used by the WDPH and future project teams to keep the data in these resources consistent and up-to-date (Figure 21). Keep all future promotional materials easily modifiable and maintainable so the promotion or its effects won’t decrease. City officials should consider recreation space diversity when developing improvement master plans. Use a categorized rubric which mirrors the field data sheet to turn qualitative measurements into quantitative data. Consult stakeholders for feedback and recommendations on methods, and consider their wants and needs when developing any new materials. When displaying the top locations, order the locations alphabetically rather than by score to avoid implied precision. We have concluded that the concept of accessible recreation extends far beyond the conventional definition of being able to locate and access places for physical activity. Over time, RecSpace will need to be updated to integrate new data as indoor and outdoor public spaces are built or renovated. Nevertheless, we believe that RecSpace fulfills its purpose by providing information on accessible recreation opportunities, and travel routes to these featured spaces for the public’s benefit. 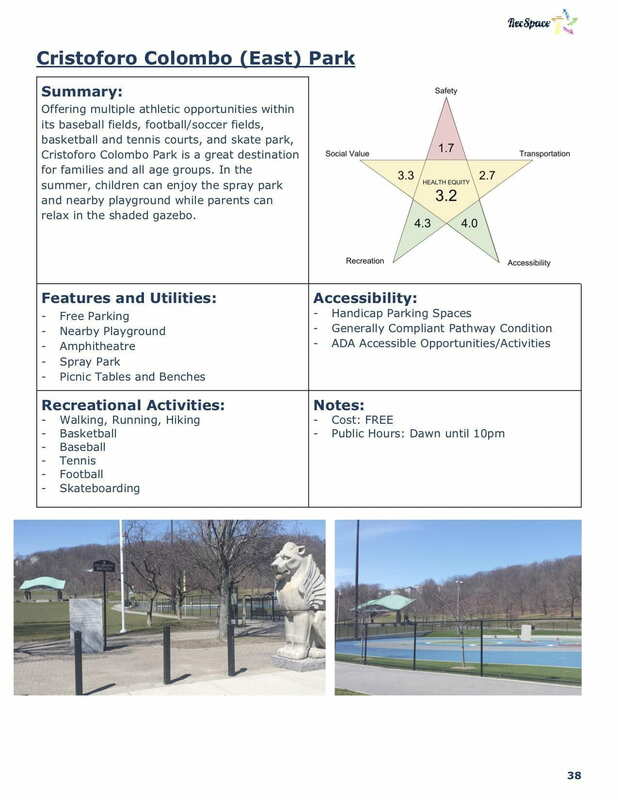 Our team reviewed, updated, and assessed accessibility features in physical recreation spaces within the CMRPHA communities, with broader social and socioeconomic perspectives in mind, and developed materials to effectively communicate this information across media platforms. 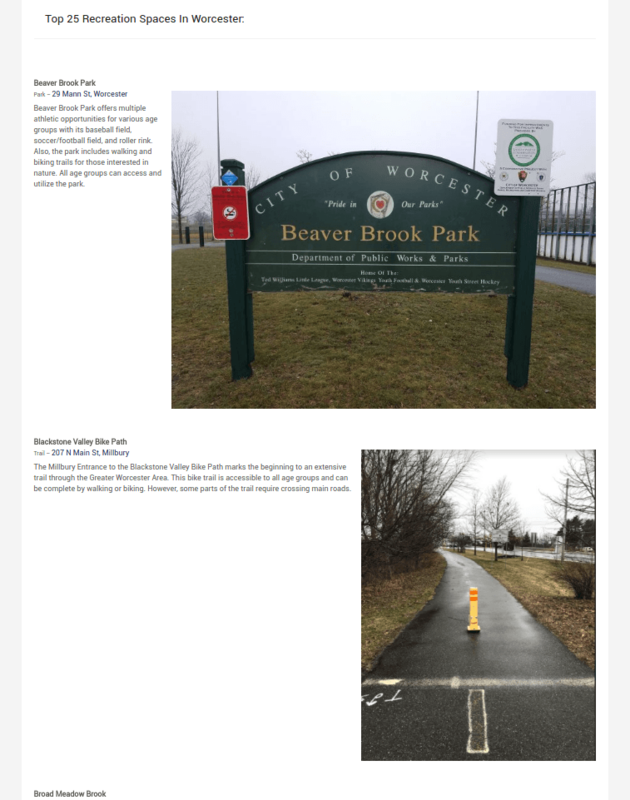 Also, this project documented and created tools to promote walking, biking, and public transportation routes to a set of featured places (CHIP objective 8.1.1). In a broader sense, this project contributed to the WDPH, the CMRPHA, and citizens of Worcester and surrounding towns by constructing a practical and relatively easy system to evaluate indoor and outdoor recreation spaces and displaying this information using a format that is readily available and user friendly.